Hotel life can be grand. You might even find yourself falling in love with a hotel room. But sometimes, you dread the very idea of even one more night in a room that doesn’t feel very home-y. You want the comfort of a real home but the amenities to help you do your best work (like good wifi and a workspace). And, because business travel is sometimes unpredictable, you need the flexibility to cancel your reservation if a trip gets moved or postponed. Airbnb for work offers all of that, plus a corporate program to take care of billing if you’d rather charge your stay directly back to your company. 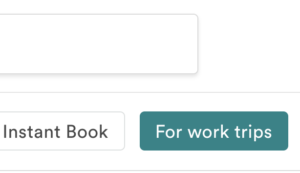 Searching is made easy with a “For work trips” filter at the top of the page. Chances are you’ve already used Airbnb for vacation, so why not try it for your next work trip? Have you used Airbnb or other home-sharing services for business travel?